My name is Erin and I love color and pattern. I search the web for colorful and fun home decor and share my finds here! Just click on the link in each post to go to the retailer's website. Don't miss out on sale prices! Get all of the day's new products delivered to your inbox in one email! I do! Visit my turquoise-only shopping blog Everything Turquoise, or my design blog House of Turquoise for beautiful home photos! 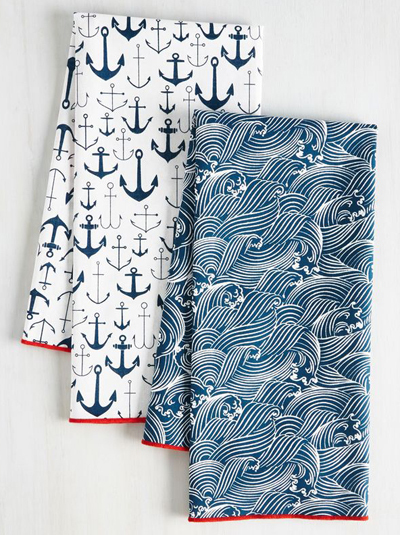 With swirling surf and an array of anchors, this navy and white Craving Waves Tea Towel Set gives your kitchen all the charms of the coastline. $17.99. Buy here.